WWPSA Recreational Soccer photo day will be held on Saturday, October 6, 2018 at Thomas Grover Middle School. Photo day will be held rain or shine. It will be held even if games are canceled due to weather. A team photograph of all the players present is taken first. Everyone who attends and completes an order form will receive a free copy of this group photo. Order forms for the team photo only will need to be filled out on site at picture day. Lifetouch sports also offers a variety of photo packages. Click here (or on the photo) to order and purchase one of these packages using Lifetouch Sports online ordering system. Individual player photos are taken only if ordered. Note: At photo day you can request “sibling” photos i.e. photos with two or more players in them. These sibling photos cannot be ordered online. Volunteers are needed to organize the players, line them up in height order, and guide them into the school. See our volunteer page to sign-up as a volunteer for this event (click here). 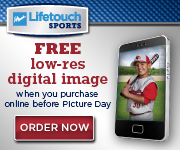 Questions about your photo order can be addressed through Lifetouch Sports Customer Service via e-mail at or toll-free at 1-800-724-1916.